As a general rule a ski will want to travel in the direction that it is pointing in, because that is the direction in which it has the least resistance, and the ski can follow it's own tracks. 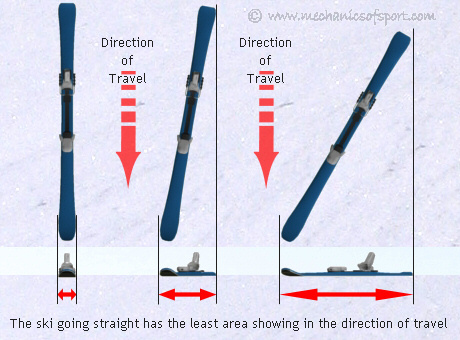 The diagram shows that in any other direction than straight forwards a ski will have more area in contact with the snow with respect to the direction of travel. This means the ski would have to push more snow out the way to go any other direction, which would use more energy. Making any direction other than straight forwards, less efficient with more resistance. Because of this a ski will always want to travel straight forwards, and a skier will need to use other techniques in this section to make the ski travel in any other direction. Naturally when we want to slow down we need more resistance, so we make the ski go sideways to lose speed. This is covered further in the creating and using resistance sections. On to the Longitudinal Weight Distribution section.